a boy, a girl, and their wee one lived in a cute house in the city. The boy was a home builder who had meticulously rebuilt the 1925 bungalow they called home. Their house was walking distance from the elementary, middle, and high schools the girl attended and the hospital where she was born. The university the girl graduated from was much further away, about five miles from their city house. She had very deep roots in their neighborhood. The couple were surrounded by family and friends who lived nearby. One day, the boy and girl had a crazy idea and wondered what it would be like to live in the country. They put their city house on the market and it sold very, very quickly. The couple leased a house about 25 minutes outside their beloved city and prepared to build a country house. But things in the country weren't as blissful as the couple had hoped. They desperately missed the conveniences of city life and the girl was saddened by all the precious time she was losing by driving back and forth to the city on a regular basis. A few months after moving to the country, the couple made the decision to uproot again move back to the city. But where would they go? They had sold their lovely city house. The couple decided to take on the massive renovation of a 1940's rental home they owned in the city. After all, the boy was a home builder and they had completed this type of project twice before with great results. So, in the heat of the Texas summer, the project began. They hope the house will be completed before school for the wee one begins in the fall. The couple are very excited about moving back to the city and are praying that things go smoothly and that they are able to stay on schedule. The 193 hexagons I basted on Memorial Day. I'm almost out of pre-cut papers and I still have a huge stack of squares remaining to baste. I also need to cut into my stash. I think my hexagon quilt is going to be larger than originally planned because I want to include every single one of these lovely fabrics! Oh my! What an adventure, I cannot wait to see your progress, I hope that all goes smoothly for you. I can't believe all of the hexies you made just over the weekend! I wish I was making them that quickly. how fun! i look forward to seeing your construction progress. and your hexagon progress continues to amaze me. they look so pretty! I will absolutely enjoy reading about and seeing your home-back-in-the-city project and all of your lovely hexagons! You had a busy holiday! I came here originally for the crafty but will happily follow the home progress. I know all about house dreaming/planning/hoping. I will enjoy watching your dream come to life! Love your quilt top from the earlier post, too, btw. And the hexagons--S-W-E-E-T! Hoping that you are having a wonderful day. Man, i wish i had the problem of too many fabrics! i've cut into my stashed, swapped and scavenged and I'm still waaaay short of what i want. I'm determined to keep accumulating scraps though, as i so want to make the perfect quilt that's residing in my head. See now. I have noticed in my travels about the Blogverse that us quilters generally love our homes. You know, they're not just machines to live in, they are enviroments we choose to surround ourselves with. They are US and OURS. So, most people who visit here for crafty goodness? Will be thrilled to see someone building their home. 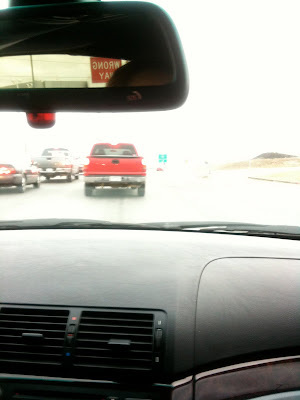 Plus, by virtue of being interested in other people's blogs? We are nosey. S'all good! I will be following your building adventure faithfully! You're wise to add this to your quilting blog...that should save time and effort. Would love to hear more about the home plans/etc. Oh, I'm excited about watching the progress on your home. That seems like alot of fun. Just throw in more eye candy and we're good to go! I'm happy you decided to share your house with us. A house and crafts on the same blog, priceless! I can't wait to see your progress on your new house. I promise you won't lose this crafty reader...and your hexes are stunning! Thanks for sharing everything with us. So, I gave in and subscribed to your blog. I'd love to see things come along on your new (old) house. We remodeled our house built in the 60's from the studs. Quite a project, but lots to be proud of. Crossing fingers for you! That was a wonderful story! I loved reading it. I can appreciate all the craziness you must have going on. How great to have projects like quilting and sewing hexagons to keep you sane. what a neat little house you sold... that's one of my fav things about living here in texas- all the little bungalow-type houses. so sweet. can't wait to see the finished re-model. i'd love for my hubby to learn to do all the re-modeling stuff! how lucky you are!! ps... your hexies are amazing! i really want to learn how to do them! Some crafting + a bit of homerenovation = YUM! 1*9*3 in one day! Good God woman give the rest of us a chance! Lol! Nice housing project, I love projects like this, they're so rewarding in the end. The new house is going to be amazing - I'm a city girl myself, so i get it. Please do share here. Also lovin' the hexies - that is a bunch! Ooh, very exciting! I will definitely stay tuned. Our renos are stalled because Hubby's been out of town a lot. SO I will live vicariously through you! I would love to see the progress!! My husband and I are building our first house now too!! We have the concrete slab and partial framing done...waiting on the main Timber Framing to arrive from Canada BC next week!! Unfortunately, we don't have an experienced home builder in the family, excavation and groundwork YES, but for the house luckily we have a good friend as our general contractor. Crossing my fingers that it all goes well for you. Renovating an old house into a home is such an exciting project to take on. Wow good luck with your project! 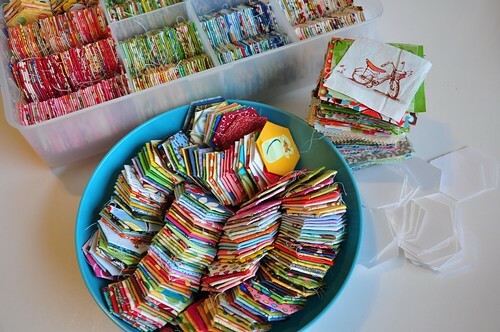 Love that bowl of Hexagons - just put that pic in to every post to keep us crafties going! An all in one is all the better for following along on this new adventure. Wow, that is quite an undertaking. Hope all the permits, inspections, and materials go smoothly into play. Oh, I'm so glad to be in good company. I would love to follow your progress, quilting and construction, on one blog. We are getting ready to break ground on our Forever Home and I was thinking of a second blog, but just convinced myself that one was enough. Keep it simple, your readers will enjoy the journey! hey, thanks for sharing about your house plans, no apologies needed. i'm sure we're gonna find it fascinating! we live in a 1897 house and i wish id documented it's removation a little better! oh and i cant believe you based all those hexies in one day!! if craft is that quick with you, i'm sure your house will sail along! 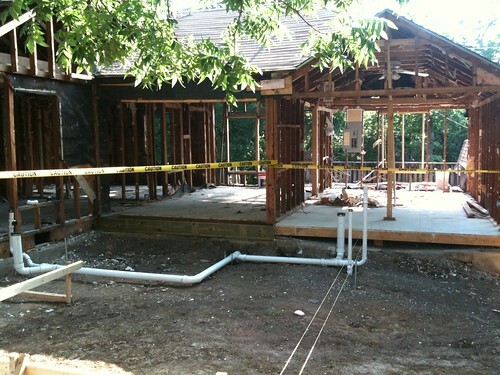 Wow, I would love to see the progress of your new home. Living in the city is very nice especially when you have children. I live just five miles out in the county so it seems like I am in the country. I am drooling over these hexagons. Just started making some last night for my quilt and they are addicting!